Vinegar came into existence, by mere chance, more than 10,000 years ago when a cask of wine had over-reached its expiration date. Centuries later in 1964, Scientist Louis Pasteur, discovered that it was the fermentation of natural sugars into alcohol followed by a secondary fermentation that resulted in the product vinegar. Throughout the time that vinegar has been known to man the substance has been distilled using ingredients such as molasses, dates, fruits, berries, melons, coconut, honey, beer, maple syrup, potatoes, beets, malt, grains and whey. Consequently, the flavors and varieties of vinegars available are just as vast and unique as the substances it is made from. Since the first accidental discovery this inexpensive kitchen staple has been used in remarkable capacities. Recorded historical uses of vinegar began as far back as 5,000 BC. -Babylonians used it as a preservative; flavoring the liquid with herbs and spices. -Roman legionnaires consumed it as a beverage. In ancient Egypt, -Cleopatra used vinegar as a solvent dissolving pearls in it to win a wager that she could consume a fortune in a single meal. -The Ancient Physician Hippocrates, discovered its medicinal qualities using it as a stringent and cough remedy. -The Greeks used it for culinary purposes in pickling vegetables and meats. -Hannibal, a great general, gained access across the Alps by heating a barrier of boulders and then doused them with vinegar. The boulders cracked and crumbled paving a path for his army to cross through. -During the American Civil War, vinegar was used to treat scurvy. -During World War I, vinegar was used to treat wounds. Today we continue to enjoy the benefits of this ancient sour wine in cleaning, household projects, medicinal remedies, organic agriculture, and the culinary arts. The following tips use ordinary distilled white vinegar. This list is just a sample of the many uses of vinegar. 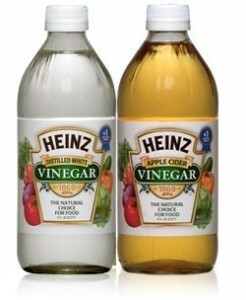 For more fun facts and tips visit VinegarTips.com for 1001 Uses for White Distilled Vinegar. Make your own cleaning solution by combining 1/2 cup vinegar, 1 cup Ammonia, 1/4 cup baking soda and 1 gallon hot water. Use vinegar to clean hard water stains from tub/shower stalls. Mix 1/2 cup vinegar and 1 cup fabric softener with 1 quart warm water. Spray glass shower door with furniture polish or lemon oil to prevent build up. For basic cleaning of tubs and sinks wipe with vinegar and then scrub with baking soda. Rinse clean with water. Whiten Grout. 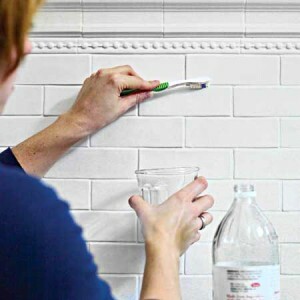 Scrub grout with a stiff brush dipped in vinegar. For extra fighting power add baking soda to make a paste. Remove mineral deposits from showerheads. Pour 1/2 cup of warm water into a resealable plastic bag. Drop in the showerhead, seal and let sit 1 hour. Rinse clean and wipe dry. Make the toilet bowl sparkle. Drop 1 denture cleaner tablet into the toilet with 1 cup vinegar. Let sit 30 minutes. Scrub with baking soda. Wipe glass doors and windows streak free. Mix 1/2 cup to 1 cup vinegar with 1/2 gallon of water. Pour into a spray bottle. Wash no-wax floors. Add 1/2 cup vinegar to a 1/2 gallon warm water. Carpet stain removal. (for the removal of fresh non-oily carpet stains) mix 1 teaspoon liquid detergent and 1 teaspoon of vinegar in a pint of warm water. Apply solution to the stain with a soft brush or towel and rub gently. Rinse with a towel moistened with clean water; blot dry. Repeat until the stain is gone. Then dry quickly, using a fan or hair dryer. Wipe out water rings on wood furniture by rubbing with a mixture of equal parts vinegar and olive oil. Rub with the grain and polish for the best results. Sanitize the refrigerator. Wipe with a solution of equal parts water and vinegar. 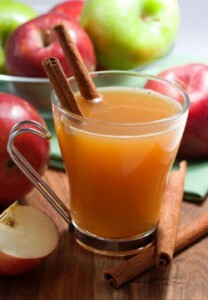 Remove odor by placing 1 cup apple cider vinegar in a glass and place it in the refrigerator for a few days. Disinfect cutting boards; a nice alternative to using bleach. Wipe with full strength vinegar. Shine stainless steel appliances and sinks. Apply vinegar with a soft cloth to remove streaks from stainless steel appliances. (Try in an inconspicuous place first) You can also use lemon oil. Keep garbage disposals fresh and clean. Make vinegar cubes by filling an ice tray with a mixture of 1 cup of vinegar and enough water to fill the ice tray; freeze. Run the mixture through the disposal, and then flush it with cold water for a minute or so. The ice sharpens the blades while the vinegar disinfects. Dishes and glasses. Pour 1 ½ cup to 2 cups vinegar in the bottom of the dishwasher. Add soap and wash full cycle. Use this technique instead of bleach to fight off the flu. Kill Germs in the Laundry. Add 1 tsp salt and 1/4 cup vinegar to wash. Fabric Softener. Add 1/4-1/2 cup to fabric softener dispenser. Especially great on baby clothes and towels. Deodorant stains. Rub with vinegar and wash as usual. For tough stains make a paste of vinegar and baking soda. Rub into stain. Leave garment in the sun. Wash as usual. Wine stains. Remove wine stains from 100% cotton, cotton polyester and permanent press fabrics within 24 hours. Sponge vinegar directly onto the stain and gently rub away the spots. Then clean according to the directions on the manufacturer’s tag. When color dyeing fabrics, add 1 cup of vinegar to the last rinse water to help set the color. Cleaning Vintage Lace. Soak the lace in cold water, rinsing it several times. Next, hand-wash with Woolite. Remove stains with equal parts vinegar and hot water. Unclog a steam iron. Pour equal amounts of vinegar and water into the iron’s water chamber. Turn to steam and leave the iron on for 5 minutes in an upright position. Then unplug and allow to cool. Any loose particles should come out when you empty the water. To remove the burn mark on the iron plate, heat equal parts vinegar and salt in a small pan. Rub the solution on the cooled iron surface. Shine brass, copper and pewter. Dissolve 1 teaspoon salt in 1 cup of vinegar. Stir in flour to make a paste. Apply paste to the metals and let stand for about 15 minutes. Rinse with clean warm water and polish until dry. Remove the blackened soot on fireplace glass doors. Wash fireplaces with a 50/50 ratio of water and vinegar to. Wipe dry with newspaper. Clean Gold Jewelry. Submerge jewelry in one cup apple cider vinegar; let sit 15 minutes. Remove and dry with cloth. Clean DVDs. Wipe smudged CDs and DVDs with vinegar. Dry completely before reinserting into player. Non-poisonous ant solution. Dab a cotton ball with vinegar. Swab areas the ants trail. Heat a pot of vinegar then pour over ant hills. Fruit fly deterrent. Place a bowl filled with 1/2 quart water, 2 tablespoons sugar, 2 tablespoons. apple cider vinegar and a couple drops dish soap. Banish stickiness. Remove stickers and price tags from glass, wood and plastic. Dab vinegar on stubborn stickers; scrap surface clean. 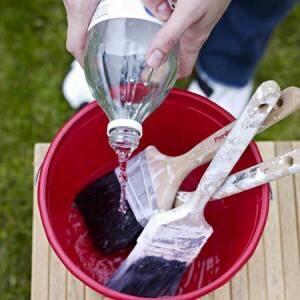 Clean paint brushes by soaking them 30 minutes in hot vinegar. Wash in hot soapy water, cleaning off paint. Rust Remover. Soak rusted tools in vinegar for a few days. Rinse with water. Increase soil acidity: In hard water areas, add a cup of vinegar to a gallon of tap water. Great for rhododendrons, gardenias or azaleas. Keep flowers fresh longer. Add 2 tablespoons sugar and 2 tablespoons vinegar with 1-quart water. Trim stems and change water every five days. Grass and weed control. To kill grass on sidewalks and driveways, pour full strength vinegar on it. For weeds, spray full strength vinegar on tops of weeds. Reapply on any new growth until plants have starved. Plant food. Mix vinegar and water in a ratio of one part vinegar to 8 parts water. Mix a separate solution of 1 part sugar to 8 parts water. Combine the vinegar and sugar mixtures. For burnt on food, submerge the area in vinegar and soak overnight. Clean with hot soapy water. To control weight swap out creamy salad dressings for a sprinkle of vinegar. Use flavors such as Champagne, Balsamic, Red Wine and seasoned. Flavor soups and stews using a tablespoon of your favorite vinegar. Meat tenderizer. Combine 1/2 cup of your favorite vinegar to 1 cup of bouillon or 1/4 cup oil. Rub into meat; let sit two hours. For sweeter more tender fish soak fish in vinegar and water before cooking. Add 1 tablespoon vinegar to water when poaching fish to keep it from crumbling. Add a little vinegar to the water when poaching or boiling eggs. It helps to keep the whites together. Prevent oxidation of potatoes. Peeled potatoes left sitting begin to oxidize and turn dark. Add a teaspoon of white distilled vinegar or cider vinegar to the pot of water. Fruit and vegetable wash. Freshen and wash vegetables by adding 2 tablespoons vinegar to 1 pint water; wash, then rinse thoroughly. Before frying doughnuts, add 1/2 teaspoon of vinegar to hot oil to prevent doughnuts soaking up extra grease. Use caution when adding the vinegar to the hot oil. To keep pets free of fleas and ticks mix 1teaspoon vinegar to each quart of drinking water. This solution is for a forty pound animal, Always get the approval of your pets doctor before trying natural home remedies. Smelly dog odor. Rinse the dog with fresh water. Saturate the dogs coat with a mixture of 1 cup vinegar and 2 gallons water. Do not rinse. Dry completely. Freshen lunch boxes by dampening a piece of bread with vinegar and enclose in the lunch box overnight. Freshen the kitchen. Odors can linger after cooking meats or with oil. Simmer an equal mix of water and vinegar until smell dissolves. Clean Calcium Deposits and Sanitize Humidifiers. Heat 1 ¾ vinegar. Pour vinegar into reservoir and replace cap. Let sit for 1 hour. Remove vinegar. Reservoir should be clean and calcium free. Contact manufacturer before cleaning with this method or review manufacturer’s directions. Relieve sunburn. Lightly rub white distilled or cider vinegar on area. Reapply as needed. For other types of burns, apply ice-cold vinegar right away to prevent blisters. Relieve dry and itchy skin such as Psoriasis. Add 2 tablespoons of vinegar to your bath water. (A compress of seaweed works well too) For dry scalp, after shampooing, rinse with a solution of 1/2 cup vinegar and 2 cups of warm water. Stop Itching. Apply a paste of vinegar and cornstarch. Keep on until itch disappears. Toenail fungus. Soak toes in a solution of vinegar and water, using 1 part vinegar to 2 parts water, 15 minutes per day. Soften callused cracked Feet. Combine 1 cup vinegar to 2 gallons warm water. Soak feet for 45 minutes then use a pumice stone or file to remove dead skin from heels and callused areas of feet. Wart Remover. Mix warm water with 1 cup vinegar. Soak area for 20 minutes everyday until wart disappears. Treat sinus infections and chest colds. Add 1/4 cup or more vinegar to a vaporizer. Add water as needed per unit instructions. Chest congestion. Inhale a vapor mist from a steaming pot containing water and several spoonfuls of vinegar. Calm a queasy stomach. If you can stomach the smell and taste try downing some apple cider vinegar in water, with a little honey. 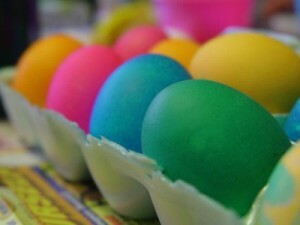 Coloring Easter eggs. Mix 1 teaspoon of vinegar with each 1/2 cup hot water; add food coloring. Naked eggs. Magically remove the shell of an egg. This project takes two days to complete. Place eggs in a container so the eggs are not touching. Add enough vinegar to cover the eggs. Cover the container, put in the refrigerator and let sit for 24 hours. Use a slotted spoon to carefully scoop out the eggs. Dump out the vinegar. Put the eggs back in the container and cover with fresh vinegar. Leave the eggs in the refrigerator for another 24 hours. Scoop the eggs out again and rinse carefully. Throw away any eggs with broken membranes. Now you should have egg without a shell. Volcano. Make the cone of the volcano by mixing 6 cups flour, 2 cups salt, 4 tablespoons cooking oil and 2 cups of water. Mix until smooth and firm. Stand a soda bottle in a baking pan and mold the dough around it into a volcano shape. Do not cover the hole or drop dough into it. Fill the bottle most of the way with warm water and a few drops of red food coloring. Add 6 drops of detergent to the bottle contents. Add 2 tablespoons baking soda to the liquid. Slowly pour vinegar into the bottle. Berry ink pens. 1/2 cup ripe berries, 1/2 teaspoon vinegar, 1/2 teaspoon salt and feather. Fit a strainer over a bowl. Place berries in strainer. Using the back of a wooden spoon, crush the berries against the strainer. Keep pressing until most of the juice has been strained out and only pulp remains. Add the salt and vinegar to the berry juice. If the berry ink is too thick, add a tablespoon of water. Store in a baby food jar sealed tightly. Cut the tip of the feather at an angle. Cut a slit in the tip. Dip the tip into the berry ink; dap on paper towel. Repeat as needed. Magic Potion. Pour 2 tablespoons vinegar into a shallow bowl or cup set on a baking sheet. Add 1 tablespoon baking soda. Hot Air Balloon. Pour 4 tablespoons vinegar into a bottle. Pour 2 tablespoons baking soda into a balloon that isn’t blown up (make a siphon out of cone of paper). Without tipping the baking soda into the vinegar, put the balloon over the top of the container. Use your hand or a rubber band to hold the seal. Jiggle the balloon so the baking soda is dumped in.